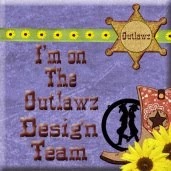 I am pleased to announce that I will be a Guest Designer for Cut@Home for a bit. Be sure to check them out, they have a ton of major brands. Be sure to signup for their VIP program for great coupons! In this tutorial I will show you how to make a colorful watercolored card using Tim Holtz Crazy Birds stamps and dies. To start with I used Canson 90# watercolor paper. Ink the stamps to be used with Versafine Black which will not run with water. 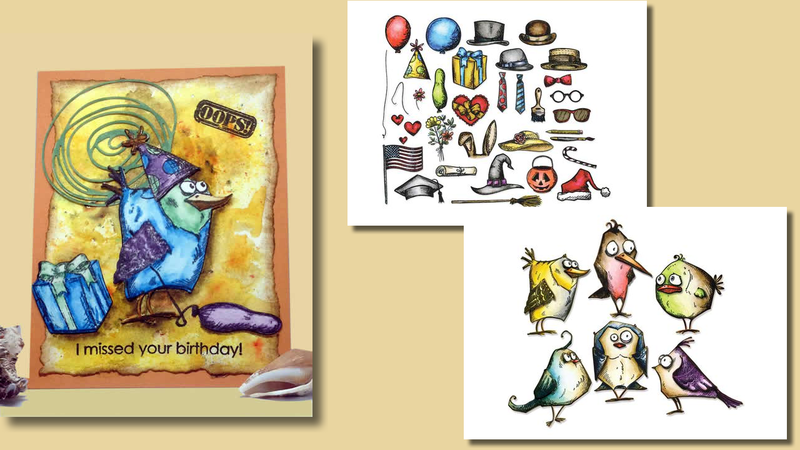 I used one of the Bird Crazy Stamps and some of the accessories from Crazy Things Stamps. 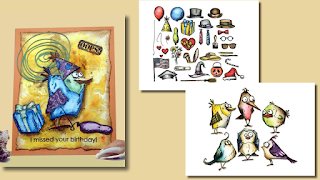 Cut each image with the coordinating dies Framelit Die Set Bird Crazy, Framelit Die Set Crazy Things on the Vagabond. 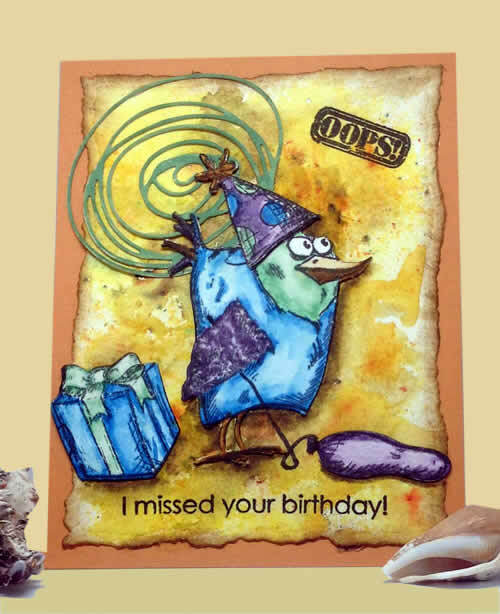 For the scribble die cut I used Scribbles & Splats Thinlits and cut using the Precision Cutting Plate on the Vagabond. Now for the background. I used Strathmore 400 Series of Cold Pressed 140# paper. Brushos is a paint pigment powder which I poked a hole in the lid. Sprinkle on a small amount of powder. I used Lemon, Yellow and Sandstone. Spritz with water. How much you spray will determine the look. I like the spots of color so I don't tend to spray a lot. 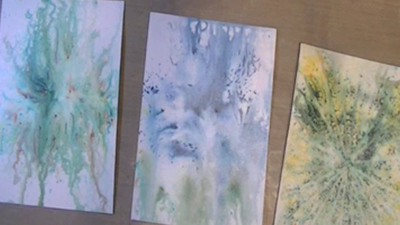 You can tilt the paper, dab, spread with a brush and even add more dry pigment to the wet areas. Just play and see what you like. I love using these powders so I have a stash of backgrounds built up:-) Don't be afraid to experiment to see what you like. If you really don't like one just use it for die cut shapes. 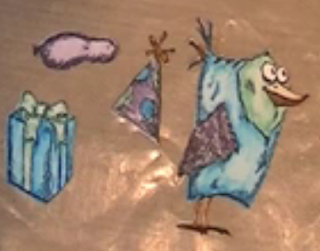 Using Distress Markers, color the images. Add full strength to the edges and shaded areas then blend with water. Or if you want a more vibrant color just use the markers. I used 4 colors on all the images. I decided to try the bird them out on different backgrounds. Once I decided on the yellow it helped me to choose the color to make the scribble. I colored it with the Cracked Pistachio. 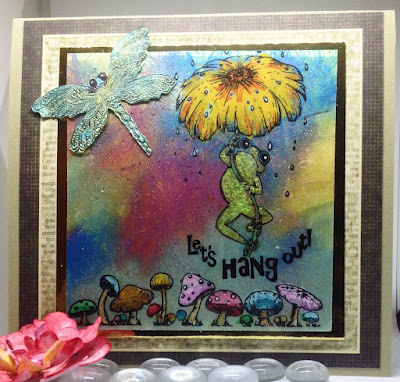 Cut the finished background using Spellbinders A2 Distressed Edges die. Cut a cardbase 4 1/4" X 11" and score at 5 1/2". I use a small tip ball on the handle from Deluxe Flower Shaping Tool Kit. I find it easier to score with the tip and handle rather then a bone folder. I do press the crease/fold with the bone folder. Next stamp the sentiment (I used some from my stash). Glue everything into place. I love the Art Institute glue. Not only because of how great it holds but the shape and material are the easiest for me to squeeze. I like a liquid glue because I can shift things a bit when needed. Last of all I drew in the line for balloons string with a black marker. I am going to show you how to make flexible embellishments for your home decor, cards or scrapbooks, using Heartfelt Creations Winking Frog collection. I decorated an embellishment jar. Today I will show you how to make the frog border. 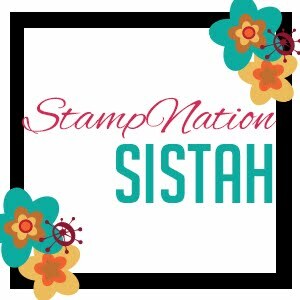 USE ONLY RUBBER STAMPS for this technique. 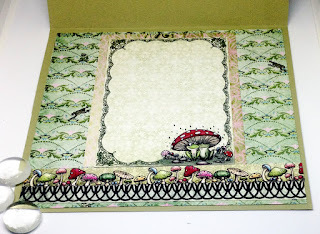 Ink the frog border using Stazon ink or your ink of choice. 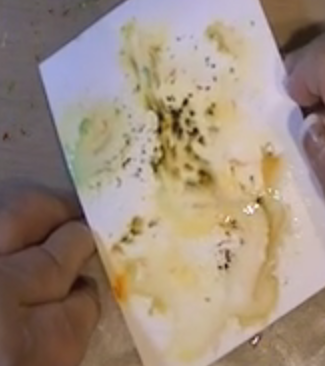 It’s OK if your ink dries…it will come off. In fact it will remove any old dried ink so be sure your stamp is clean. If you have a die, lay it over your stamp. You don’t have to have a die but if you do it makes trimming the piece so much easier. For this one I had NO trimming to do. Now let’s get the gel mixture ready. I use 1 part Liquitex Glossy Gel Medium, any brand will do. Use 1 part Gel Medium and 1 part high viscosity acrylic paint. I love the Pebeo irridescent colors…this is yellow green. If your paint is a bit thinner just use more gel. Mix well with your palette knife. Spread a thin layer first to avoid air bubbles then fill it up. Make it as thick as possible since it will contract as it dries. Smooth it out. Now remove the die and wash it off right away. Fill in any areas that need more gel. Now WAIT 24 hours! 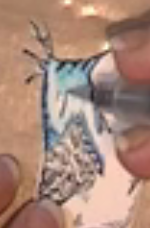 Then gently start peeling the gel from the stamp. Trim if needed. If you used white paint you can color using Copics or other alcohol markers, smear on or paint with acrylics, Inka Gold etc. Have fun and let your imagination go! I love the acetate stamping,painting and floor wax technique. I got a new lightbox but it still doesn't do it justice! It is sooo sparkly! Gold Mirror cardstock, Stazon Black ink, Pebeo Studio Acrylics, Pebeo Iridescent Green Yellow, Blue Green, Violet Blue, Vivid White, Liquitex Gel Medium, Clear floor wax, tissue paper, acetate, glitter, Vellum,. Card measures 6 1/2” x 6 1/2”. Card base is 6 1/2” X 12” scored at 6”. 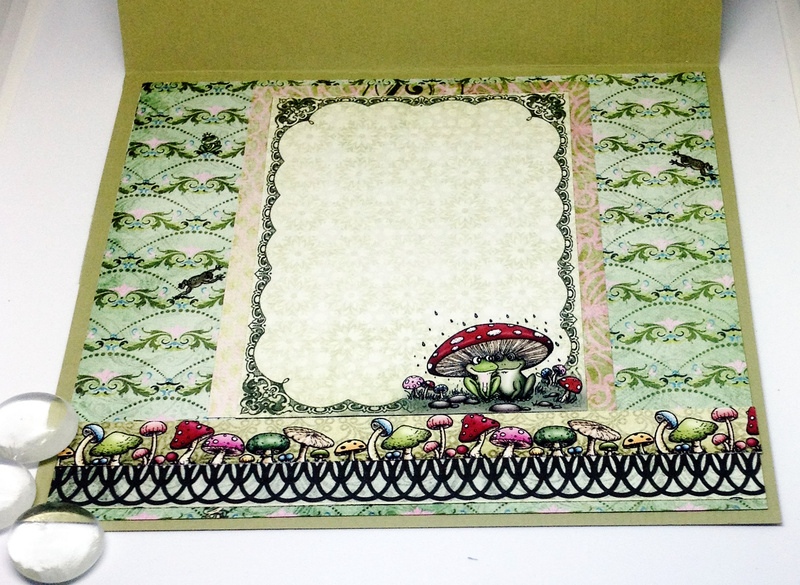 Use a 6” X 6” panel from the Winking Frogs Paper Collection and adhere to center of cardstock front. Cut a piece of Gold Mirror cardstock to cover the center area of the panel. 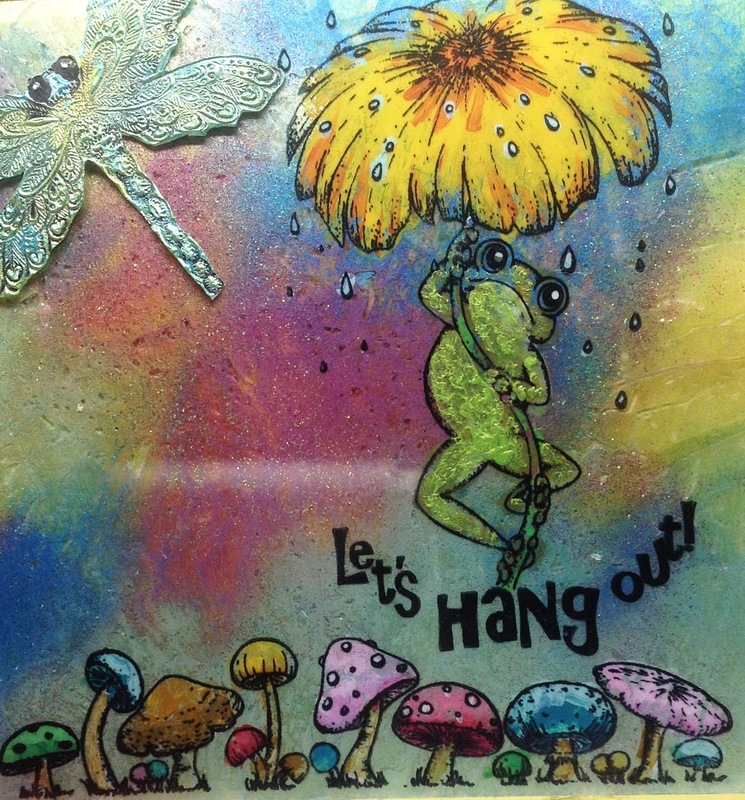 Stamp the images From Leaping Frogs & Froggy Hangout onto 6” X 6” acetate using Black Stazon ink. Leave space around the image. The extra space is helpful to help wax not get on the front side later:-) On the backside, color using various Pebeo acrylic paints. The first layer of paint should be what you want to see from the front. Color the orange shadows on the flower, spots on the mushrooms and let dry. Then paint the remaining colors. Using a good size paint brush apply a thin layer of clear floor wax. 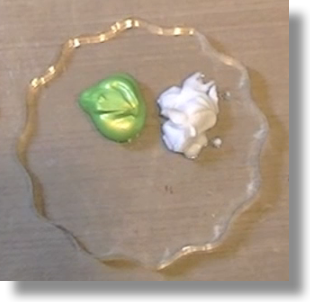 Dab some Perfect Pearls and blend into the wax in a random pattern (teal, pink, yellow & green used). Then sprinkle on a lot of glitter. Crumble a piece of tissue paper then spread it out. Lay the tissue over the wax and use the brush to press on. If it isn’t totally wet apply wax as needed and use the brush to push in some wrinkles for texture. Lift the acetate carefully and be sure no wax is on the front. Let dry overnight. 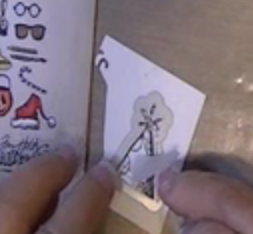 Use a guillotine cutter to trim the acetate to 1/2” smaller then the mirror cardstock. Adhere acetate piece over the mirror cardstock only in the 4 corners. The butterfly is a homemade embellishment. HFC stamps is great for this technique since it only works with rubber. Mix 50% Vivid White Pebeo Studio acrylic paint (or any extra thick acrylic paint) and 50% Liquitex or Pebeo gel medium, mix well. 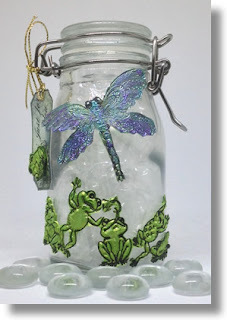 Ink the Butterfly stamp from Froggy Hangout with Stazon Ink. I used the dies in an unconventional manner but they helped out a ton! No fussy cutting needed. See picture for what it looked like before using the die. Lay the coordinating die on top of the stamp, cut side up. 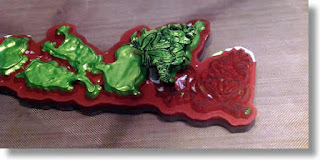 Use a pallet knife to spread a thick layer of the gel mixture over the stamp. Carefully remove the die and wash it right away. Set aside to dry overnight. 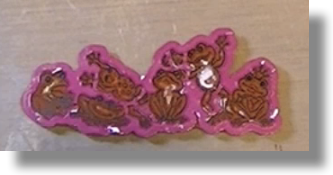 The gel is only on the image and not all of the rubber. The next day peel off from the stamp and trim if needed with scissors. *Note* any ink on the stamp will come up so be sure it is clean if it is a different color then you are using. Color the butterfly with Pebeo acrylics Iridescent Green Yellow, Blue Green, Violet Blue. You can also color with Copics or Inka Gold. The inside was done very simply. Adhere a 6” X 6” panel from the Winking Frogs Paper Collection. Cut a smaller panel for writing on and layered with more paper. Add 2 border strips from the paper collection.